Day of the Dead is the Mexican holiday celebrating the spirit of your deceased loved ones. Celebrations traditionally begin at midnight on October 31st and continue until November 2. While each town and region in Mexico has its own unique Day of the Dead customs, there are certain universal traditions that have developed over the centuries. Elaborate home altars, calledofrenda’s, are traditionally made to honor those departed spirits who have come back home for a brief visit. Food and personal memorabilia are left on the altar, and it is believed that the spirits will consume the essence and enjoy their aroma of the offerings. After the spirits have returned to the spirit world, family and friends will enjoy a feast of the altar foods. Also traditionally left on the home altar is a sugar skull, which has the departed person’s name inscribed on it. 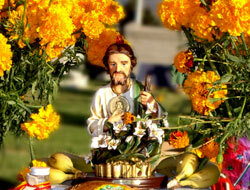 Marigolds, called cempasuchil in Spanish, are a seasonal flower, which grace the Day of the Dead altars. And pan de muertos is a special bread traditionally baked for the holiday. In addition to building altars at one’s home, many people traditionally visit cemeteries and decorate their family members’ graves. Some villagers leave a path of flower petals between the cemetery and their homes, so their loved ones can find the way. In other towns, people spend the whole night at the cemetery, having a festive celebration that includes music, food and even alcohol. Day of the Dead celebrations have continually changed and adapted throughout modern history, bridging a diversity of cultures and customs in Mexico and to the north, in the United States. Celebrations for Day of the Dead are also becoming increasingly popular in America, especially in communities with large Hispanic populations. As these festivities have taken root, the influence of Halloween is growing — not only in the U.S. but also back in Mexico. Mexican children now go trick-or-treating and dressing up in costumes has become a popular tradition.